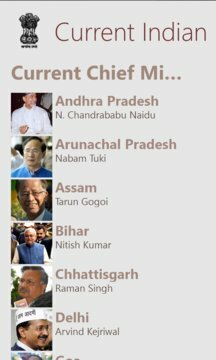 A simple and easy to use app to keep yourself updated about the Chief Ministers of all the States of India. 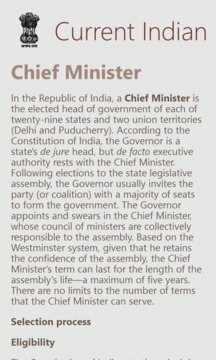 In the Republic of India, a Chief Minister is the elected head of government of each of twenty-nine states and two union territories (Delhi and Puducherry). According to the Constitution of India, the Governor is a state's de jure head, but de facto executive authority rests with the Chief Minister. Following elections to the state legislative assembly, the Governor usually invites the party (or coalition) with a majority of seats to form the government. The Governor appoints and swears in the Chief Minister, whose council of ministers are collectively responsible to the assembly. Based on the Westminster system, given that he retains the confidence of the assembly, the Chief Minister's term can last for the length of the assembly's life—a maximum of five years. There are no limits to the number of terms that the Chief Minister can serve.